You may have seen in my previous post that I have been working on the latest (and hopefully final) major revision of the CC1. Many of the previous decisions on the radio architecture have been thrown out, perhaps most importantly the decision to use a dual-gate MOSFET as the mixer. In the quest for a replacement, I considered using the old standby, a diode ring mixer, but I wanted to be open to other possibilities as well. As shown in that last post, the KISS mixer from Chris Trask seems to have excellent intermod performance with relative simplicity. So the current plan is to try to build an IF chain using the KISS mixer and see if it will work well in the CC1. The current candidate for the IF topology is similar to the design seen in Figure 6.89 in Experimental Methods in RF Design, with no gain until after the first IF filter. To that end, I’ve been looking a various amplifier designs to see if I could find something that would fit (or at least come close to) the requirements above. Bipolar amps are nice, but use a lot of current. MMICs were another possibility; the ones I have found do have about +20 dBm OIP3, but with around 20 mA of current draw and approximately 20 dB of gain, which means the IIP3 is not that great. I figured it wouldn’t hurt to take a look at the dual-gate MOSFET again, as I know that at least they can use modest current and many have excellent noise figure. Without getting into the weeds of every detail of the experiment that I tried, I’ll just recap the important parts. 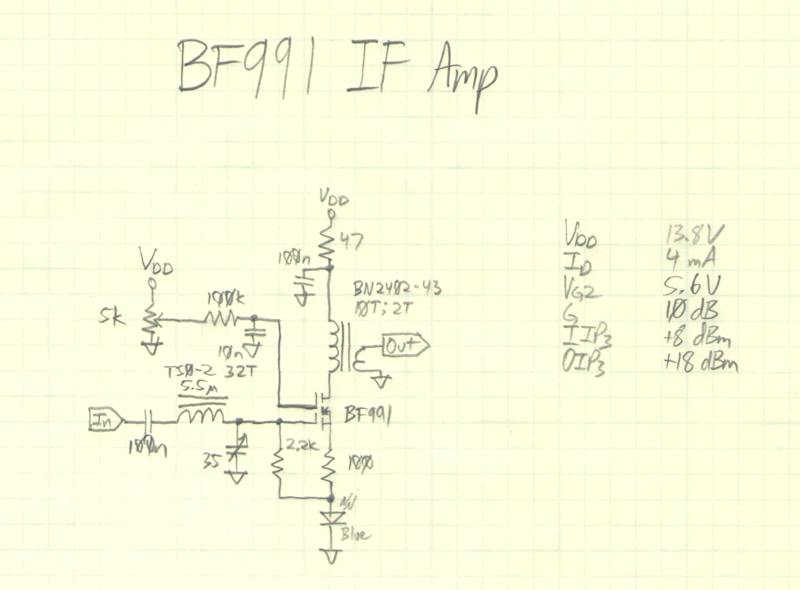 Initially I used a BF998 with an L-network on gate 1 to transform the 2.2 kΩ input impedance of the amplifier to 50 Ω. A pot was provided to provide variable voltage bias to gate 2. Different permutations of source resistor and gate 2 bias were tried, and the best IIP3 I could get from that amplifier was about -3 dBm (with perhaps 14 dB of gain). OK, but not great. So I decided to give the BF991 a try and see what I could get out of it. Again, I tried many variations of source resistor and gate 2 bias, and was able to find a configuration that is somewhat promising. You can see in the schematic above that I settled on a source resistor of 100 Ω and “dipped” the gate 2 pot for best IP3, which came out at 5.6 V of bias. I also found in previous trials that leaving the source bypass capacitor out improved the IP3 a few dB and decreased the gain a few dB, which was a worthy improvement. Input and output was matched for 50 Ω. The current consumption was only 4 mA, which is pretty great for an IF amp in a portable radio. 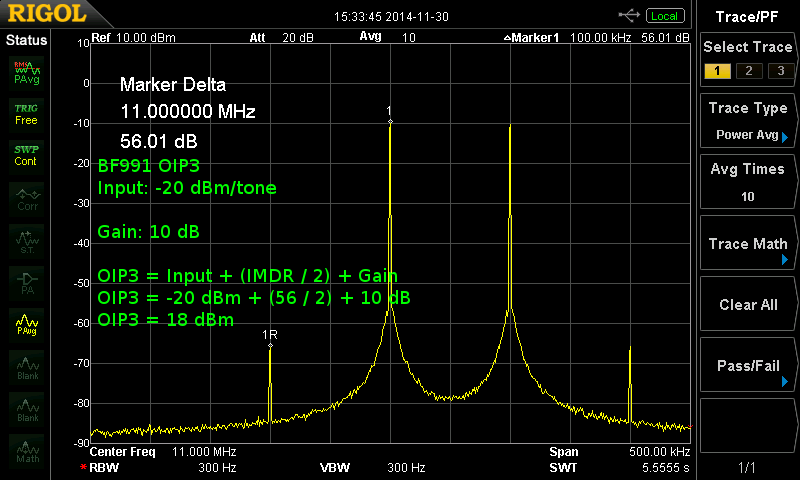 Here is the capture of the OIP3 measurement from my DSA815-TG. Only 10 dB of gain, but that is OK as we wanted modest gain. The IIP3 measured +8 dBm, and when you add in the 10 dB of gain, the OIP3 is +18 dBm, which is pretty close to my original spec, and all for only 4 mA. This all looks very reasonable. But there’s one problem. The good IP3 is highly dependent on VDD and VG2, especially the gate 2 voltage. As this is going to be a production radio, there needs to be a reliable way to set VG2 during calibration, every time. Also it appears that I probably need some way to keep VDD stable over a variety of voltage inputs, such as a LDO voltage regulator (maybe 9 or 10 V would work). But I need as much headway as possible in VDD in order to get the most out of my dual-gate MOSFET amp. In my experience, they don’t like being voltage-starved. There also appears to be a bit of dependency on the tuning of the input L-network, although that is not as pronounced as the other effects.